For other kings named Olaf, see King Olaf (disambiguation). Olav V (born Prince Alexander of Denmark; 2 July 1903 – 17 January 1991) was King of Norway from 1957 until his death. Olav was the only child of King Haakon VII of Norway and Maud of Wales. He became heir apparent to the Norwegian throne when his father was elected King of Norway in 1905. He was the first heir to the Norwegian throne to be brought up in Norway since Olav IV, and his parents made sure he was given as Norwegian an upbringing as possible. In preparation for his future role, he attended both civilian and military schools. In 1929, he married his first cousin Princess Märtha of Sweden. During World War II his leadership was much appreciated and he was appointed Norwegian Chief of Defence in 1944. At his death in 1991, he was the last surviving grandchild of Edward VII of the United Kingdom and Alexandra of Denmark. Olav was born Prince Alexander Edward Christian Frederik in Appleton House on the royal Sandringham Estate, Flitcham, United Kingdom. His parents were Prince Carl (Haakon VII), second son of Crown Prince Frederick of Denmark (later King Frederick VIII), and Princess Maud, youngest daughter of King Edward VII of the United Kingdom, who was the eldest son of Britain's Queen Victoria. When Olav's father was elected king of Norway, he took the Norwegian name Haakon VII, and on the day he was inaugurated, he gave his son the Norwegian name Olav after Olaf II Haakonsson. Olav was thus the first heir to the throne since the Middle Ages to have been raised in Norway. Unlike his father, who was a naval officer, Olav chose to complete his main military education in the army. He graduated from the three-year Norwegian Military Academy in 1924, with the fourth best score in his class. Olav then went on to study jurisprudence and economics for two years at Balliol College, Oxford. During the 1930s, Crown Prince Olav was a naval cadet serving on the minelayer/cadet training ship Olav Tryggvason. Olav moved up the ranks of the Norwegian armed forces, rising in the army from an initial rank of first lieutenant to captain in 1931 and colonel in 1936. He was an accomplished athlete. Olav jumped from the Holmenkollen ski jump in Oslo and competed in sailing regattas. He won a gold medal in sailing at the 1928 Summer Olympics in Amsterdam and remained an active sailor into old age. On 21 March 1929 in Oslo, he married his first cousin Princess Märtha of Sweden with whom he had two daughters, Ragnhild and Astrid and one son, Harald. As exiles during World War II, Crown Princess Märtha and the royal children lived in Washington, D.C., where she struck up a close friendship with Franklin D. Roosevelt. She died in 1954, before her husband ascended the throne. The British Film Institute houses an early film, made in 1913, in which a miniature car (a "baby Cadillac") commissioned by Queen Alexandra for Crown Prince Olav tows a procession of Londoners through the streets of the capital, before being delivered to a pair of "royal testers" of roughly Olav's age. The car is a battery-powered, one-third size replica on a four-foot wheelbase, and is on permanent loan to the Norsk Teknisk Museum in Oslo. As Crown Prince, Olav had received extensive military training and had participated in most major Norwegian military exercises. Because of this he was perhaps one of the most knowledgeable Norwegian military leaders and was respected by other Allied leaders for his knowledge and leadership skills. During a visit to the United States before the war, he and his wife had established a close relationship with President Roosevelt. These factors would prove to be important for the Norwegian fight against the attacking German forces. In 1939, Crown Prince Olav was appointed an admiral of the Royal Norwegian Navy and a general of the Norwegian Army. During World War II, Olav stood by his father's side in resisting the German occupation of Norway. During the campaign he was a valuable advisor both to civilian and military leaders. When the Norwegian government decided to go into exile, he offered to stay behind with the Norwegian people, but this was declined. He reluctantly followed his father to the United Kingdom, where he and his staff and servants and aides continued to be a key advisor to the government-in-exile and his father. It is a popular legend among his countrymen that he did not allow himself any dessert or sweets for the duration of the Norwegian occupation. Olav made several visits to Norwegian and Allied troops in the United Kingdom, Canada and the United States. In 1944, he was appointed to the post of Norwegian Chief of Defence and after the war he led the Norwegian disarmament of the German occupying forces. His war decorations from other nations, including the War Crosses of Norway, France, Greece and the Netherlands, the US Legion of Merit and the French Médaille Militaire, are testament to the international recognition of his contribution to the war against Hitler. Succeeding to the Norwegian throne in 1957 upon his father's death, Olav reigned as a "People's King," and became extremely popular. He liked to drive his own cars, and would drive in the public lanes, even though as a monarch he was allowed to drive in bus lanes. During the 1973 energy crisis driving was banned on certain weekends. King Olav never wanted to miss an opportunity to go skiing, and while he could have driven legally, he wanted to lead by example. So he dressed up in his skiing outfit, and boarded the Holmenkollbanen suburban railway carrying his skis on his shoulder. He was later asked how he dared to go out in public without bodyguards. He replied that "he had 4 million bodyguards" —the population of Norway was at the time 4 million. 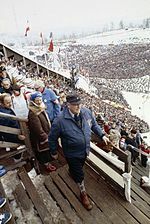 For his athletic ability and role as King, Olav earned the Holmenkollen medal in 1968, the Medal for Outstanding Civic Achievement in 1970 and was made Name of the Year in 1975. He had a strong interest in military matters and took his role as titular Commander-in-Chief very seriously. As well as his ceremonial roles in the Norwegian Army, he also served as Colonel-in-Chief of the Green Howards (Alexandra, Princess of Wales's Yorkshire Regiment), the British regiment named for his grandmother Queen Alexandra. The King represented Norway extensively abroad during his reign, conducting state visits to both neighbouring countries and more distant destinations such as Ethiopia and Iran. King Olav V opened the 14th World Scout Jamboree in July 1975 in the presence of 17,259 Scouts from 94 countries. During the summer of 1990, the King suffered from health problems, but recovered somewhat during Christmas the same year. At the age of 87, on 17 January 1991, while residing in the Royal Lodge Kongsseteren in Oslo, he became ill and died in the evening of a myocardial infarction. An interview given by King Harald V and hints in a biography by Jo Benkow, who was the President of the Storting at that time, mention the possibility that King Olav suffered great trauma upon learning of the outbreak of the first Gulf War, which began the day of his death. Olav's son Harald V succeeded him as King. On the night of his death and for several days up until the state funeral, Norwegians mourned publicly, lighting hundreds of thousands of candles in the courtyard outside the Royal Palace in Oslo, with letters and cards placed amongst them. The National Archives have preserved all these cards. The state funeral of King Olav was held on 30 January 1991. During the funeral procession from the Royal Palace to Oslo Cathedral, over 100,000 people lined up along Karl Johans gate to pay their respects. Prime minister Gro Harlem Brundtland gave the eulogy at the funeral, before the casket was moved to Akershus Fortress where a private service was held. Olav was finally laid to rest next to his wife Märtha in the green sarcophagus of the Royal mausoleum. 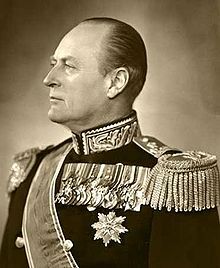 King Olav's role during the dissolution between the union of Norway and Sweden[clarification needed] and his leadership during the Second World War made him a symbol of Norwegian independence and national unity. As King Olav's wife, Princess Märtha, died of cancer, the King Olav V's Prize for Cancer Research was established in 1992. A 2005 poll by the Norwegian Broadcasting Corporation named King Olav "Norwegian of the Century". Viktor Andersen portrayed the two-year old Prince Alexander (Olav) in the 2009 NRK drama series Harry & Charles. Actor Anders Baasmo Christiansen was chosen to portray Crown Prince Olav in the 2016 drama The King's Choice. Iran Commemorative Medal of the 2500th Anniversary of the founding of the Persian Empire (14/10/1971). Norway A 180 000 km² area (Prince Olav Coast) and the Prince Olav Mountains in Antarctica are named in his honour. Norway Olav V Land on Svalbard is named in his honour. Norway In 1961 the King was a laureate of the Nansen Refugee Award. Norway In 1968 he was awarded the Holmenkollen medal. Norway In 2005, Olav was proclaimed the Norwegian of the Century, with 41 percent of the tele-votes in a popular competition held by NRK. United Kingdom In 1959, Olav was granted the honorary rank of Air Chief Marshal in the Royal Air Force. United Kingdom In 1988, Olav was granted the honorary rank of Admiral of the Fleet in the Royal Navy. South Georgia and the South Sandwich Islands Prince Olav Harbour on South Georgia is also named in his honour. Norway Member of the Independent Order of Odd Fellows. Märtha and Olav in 1950. Olav in 1921 as Crown Prince. ^ Coronation discarded by constitutional amendment in 1908. Olav V instead received benediction in Nidaros Cathedral. ^ a b "Folkekongen ble århundrets nordmann". Aftenposten (in Norwegian). 17 December 2005. Retrieved 14 July 2011. ^ Sandelson, Michael (28 October 2011). "Norway's Queen Maud in euthanasia speculations". The Foreigner. Retrieved 9 July 2013. ^ "Olav to Martha". Time Magazine. 21 January 1929. Retrieved 17 January 2009. ^ Benkow 1991, pp. 97-108. ^ Bratli & Schau 1995, p. 93. ^ a b Dahl 1982, p. 48. ^ F.S. Bennett (Director) (1913). The Smallest Car in the Largest City in the World (motion picture). London, England: British Film Institute. Retrieved 15 May 2017 – via YouTube. ^ Morton, Ian (30 August 2003). "Right Royal Fun in a Baby Cadillac". The Daily Telegraph. Retrieved 15 May 2017. ^ "Tronskiftet 1991". www.kongehuset.no (in Norwegian). Retrieved 13 April 2018. ^ AS, TV 2. "I dag er det 25 år siden kong Olav døde". TV 2 (in Norwegian). Retrieved 13 April 2018. ^ Berge, Jørgen. "Gro: - Jeg hadde et nært forhold til kong Olav". Nettavisen (in Norwegian). Retrieved 13 April 2018. ^ Dahlmann, L. A. "The secret journey of Queen Maud's coffin | norwegianhistory.no". Retrieved 7 February 2019. ^ "People". Time Magazine. 26 October 1962. p. 1. Retrieved 17 January 2009. ^ "No. 41815". The London Gazette (Supplement). 11 September 1959. p. 5791. ^ Solholm, Rolleiv (14 November 2008). "King Harald receives honorary title". Norwegian Broadcasting Corporation. Norway Post. Retrieved 4 May 2013. ^ Suits 2011, p. 53. Benkow, Jo (1991). Olav – menneske og monark (in Norwegian) (3rd ed.). Oslo: Gyldendal Norsk Forlag. ISBN 82-05-20192-7. Bratli, Kjell Arne; Schau, Øyvind (1995). Sjøoffiser og samfunnsbygger : Vernepliktige sjøoffiserers forening : 100-års jubileumsbok : 1895–1995 (in Norwegian). Hundvåg: Sjømilitære Samfund ved Norsk Tidsskrift for Sjøvesen. ISBN 82-91008-09-4. Dahl, Hans Fredrik (1982). Norge under Olav V (in Norwegian). Oslo: Cappelen. ISBN 8202090520. Flint, Peter B. (18 January 1991). "Olav V, Norway's King 33 Years And Resistance Hero, Dies at 87". New York Times. Suits, Julia (2011). The Extraordinary Catalog of Peculiar Inventions: The Curious World of the Demoulin Brothers and Their Fraternal Lodge Prank Machi nes - from Human Centipedes and Revolving Goats to ElectricCarpets and SmokingC. Penguin Publishing Group. p. 53. ISBN 978-1-101-54576-8. Wikimedia Commons has media related to Olav V of Norway.